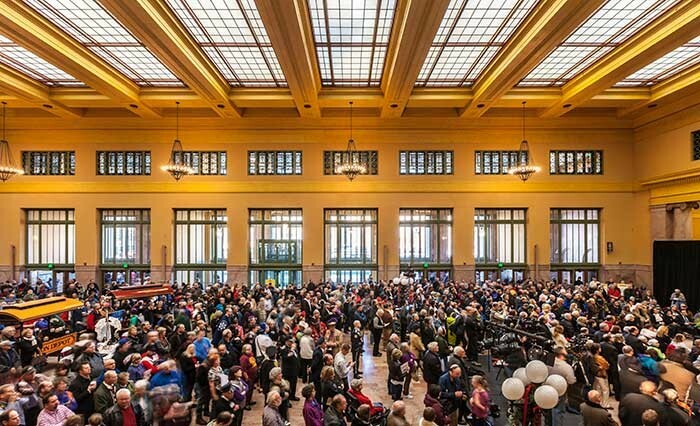 USA - A recent renovation has restored St. Paul’s Union Depot to its original 1920s splendor while a new sound system with Community ENTASYS loudspeakers has brought intelligible voice announcements and clear sound reinforcement to the depot’s transit services and its many public events. Originally completed in 1926, Union Depot served as many as 300 trains and 20,000 passengers each day. But, as passenger rail travel declined, the last train left the depot in 1971 and the historic structure became home to restaurants, offices, and condominiums. Now, after its renovation, the depot again serves both light and long-distance rail (Amtrak), local and intercity bus travel and automotive, bicycle and pedestrian traffic. In addition, the depot hosts concerts and art shows as well as banquets and other events. 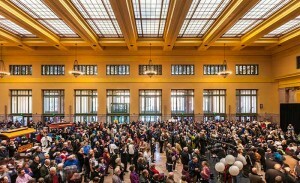 As the building architect and engineer of record, HGA Architects and Engineers worked with the Ramsey County Regional Rail Authority (RCRRA), and the project engineers and construction companies to carefully restore the building’s beautiful interior which is finished in brick, plaster, marble and terrazzo. HGA’s Joe Wetternach, P.E., says the depot’s historic interior displays the best of 1920s architecture and craftsmanship but the large open spaces and hard surfaces produce "terrible acoustics". And, due to Union Depot’s listing on the National Register of Historic Places, no acoustic treatment was allowed in the restoration. Despite these challenges, one of the project’s goals was a sound system that would provide clear, intelligible voice paging for transit passengers and add important supplemental voice evacuation functions to the facility’s fire alarm. In addition, the system needed to offer sound reinforcement services for the frequent banquets, art shows and other events hosted by the depot. Finally, the system needed to have minimal visual impact on the newly restored interior. Wetternach chose a distributed system design based on Community ENTASYS column line arrays placed along the walls and aimed into the public spaces. "The way to treat a problem like this is to not create a problem in the first place," said Wetternach. He achieved this by placing double-stacked ENTASYS loudspeakers at the "people space" height which provides even coverage within ±3dB while keeping sound out of the high arched ceilings and minimizing reverberation. The result is a system that meets its intelligibility goals with clear announcements and natural sounding voice reinforcement for events. The ENTASYS loudspeakers were custom painted by Community to blend with the depot’s interior and were supplemented by Community CLOUD4 ceiling loudspeakers in low-ceiling areas and I/O-5 surface-mount loudspeakers in outdoor areas. "We really honed in on the ENTASYS," said Wetternach, "for this project, it provided just the right balance of performance to value." A Biamp Vocia system provides DSP, mixing, zoning and amplification and includes ambient noise compensation to maintain a suitable system level with varying crowd and transit noise. The Vocia also provides fault monitoring and an interface to the facility fire alarm for use in voice evacuation. Since its restoration, Union Depot has become a big success in the life of the city of St. Paul. Supported by its sound system, the depot’s transportation services and its growing list of concerts, art shows and other events will continue to add to this success.